﻿Grandparents Day: Calendar, History, Tweets, Facts, Quotes & Activities. Grandparents Day serves to honor and recognize the contributions of grandparents in our lives. Grandparents are a society and a family's ties to its past as they pass on important values, beliefs and ideals to future generations. Their wisdom and love are recognized every year on the first Saturday after Labor Day in September. 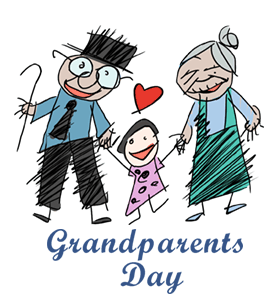 National Grandparents Day was founded by Jacob Reingold and Marian McQuade. In 1961, during the White House Conference on Aging, Reingold was inspired to focus on the role of grandparents in society and he subsequently held the first Grandparents Day at his retirement home later that year. By 1961, the New York borough of the Bronx had made Grandparents Day an official holiday. Then, in 1970, Mrs. McQuade began to petition for the government to proclaim a day for grandparents. In 1973, the first Grandparents Day was proclaimed in West Virginia and in 1978, bill to proclaim National Grandparents Day was signed by President Jimmy Carter. According to President Carter, The elders of each family have the responsibility for setting the moral tone for the family and for passing on the traditional values of our Nation to their children and grandchildren. The bill to create Grandparents Day was introduced to the U.S. congress in February of 1977. In 1978, the United States Congress passed legislation to proclaim the first Sunday following Labor Day as the United States National Grandparents Day. According to the 2013 United States Census, more than 2.7 million grandparents are responsible for providing the basic needs of 1 or more grandchildren under the age of 18 and living with them. Of these, 1.7 million were grandmothers and 1.0 million were grandfathers. Adopt-a-grandparent. By 2030, it is expected that 5.3 million elderly individuals will be living in nursing homes. Of these, approximately 60% of nursing home residents do not receive visitors. Nursing homes often have volunteer programs that match volunteers to residents. Volunteer in a local nursing home to adopt-a-grandparent. Spend the time making arts and crafts, reading or just talking. Take your grandparents out for a dinner or Broadway Show. Give a personal gift for your Grandparents to show how much you appreciate them. Our picks: Scrapbooks of family photos; CD with all of their favorite songs; Embroidered scarves or sweater. Have your grandparents tell you a story about what the world was like for them when they were young. Their valuable experiences may be timeless and very helpful today.